Plunkers use heavy weight to hold the rigging stationary and a lure float up from bottom. Put the rod in a pole holder and wait until a fish moving upstream runs into the lure and bites it. Plunking is usually done in high water but can also be done in clear. In clear water the fisherman must lighten his tackle up to match the conditions of the river. Common Lures for plunking include Large Spin & Glows on a fixed leader. 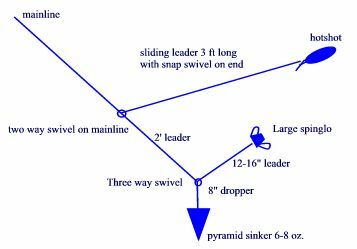 A hot shot on a sliding leader placed on line after the Spin and Glow and sinker are in place in river. Spin glows and hot shots give the bait a action even though they are stationary. Heavy lines are important for Plunking to keep the spin glows from tangling. Most Plunkers use pole holders pounded into the river bank. Fish can hit violently taking your pole into the river and you chasing after it. Common accessories for plunking include a 5-gallon bucket (to use for chair after carrying the accessories), fire wood, newspaper (fire starter), Pole holder, rain gear, lunch, clip on bell (with surveyors tape attached) cribbage board, cards, book and whiskey!!!! The plunkers who have taken this to the next level also have built a shack to stay out of the weather.